There are a few nutrition tips that every Registered Dietitian can recite at any moment. These very helpful, slightly cliché in our world, education points have been so deeply ingrained in our minds that you can just say the word and we will start running our mouths. One is HIGH POTASSIUM FOODS to avoid for certain kidney conditions (“bananas, oranges, potatoes and tomatoes“), the other is a HEART HEALTHY DIET (“only 5-10% of the sodium we consume comes from the salt shaker…“) and the last is HEALTHY COOKING TECHNIQUES (“bake, steam, grill, broil…“). 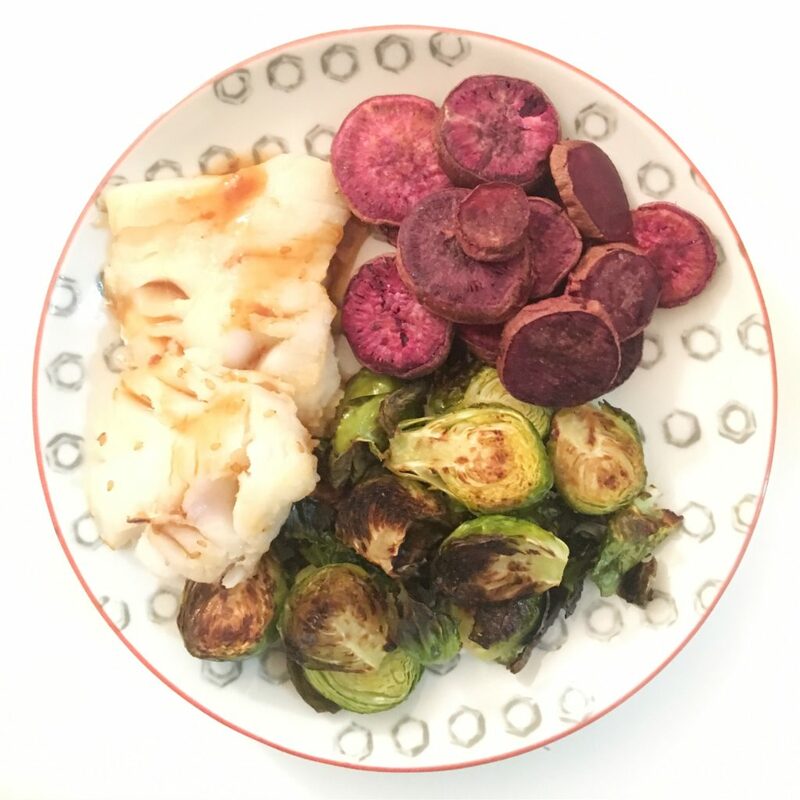 In my first ever recipe post, I wrote about how as the “Acrobat” I juggle nutrient dense ingredients (like fruits, veg, whole grains, lean proteins, nuts, seeds…) with booming flavors (herbs, spices, alliums) and simple techniques (like using my oven). This recipe does exactly that while celebrating the age old “healthy cooking techniques” tip and creating a balanced plate of course. In short, I’m going “back to basics” with this dish while saying sorry to my Barney Stinson fans- as I just found a scenario where “new is NOT always better“. Start with the brussels and potatoes: Arrange all the potatoes on one baking dish and all the brussels on the other; to each baking dish add 1 tablespoon olive oil, 1 teaspoon salt and 1/2 teaspoon pepper; then add the onion powder to the brussels and the garlic powder to the potatoes. Toss content of both baking sheets and bake in the oven for 15-20 minutes (flipping potatoes and shaking brussels half way through) until brussels are slightly browned and potatoes are fork tender. If you can fit all 3 pans in the oven at once, GREAT, otherwise bake the cod in the oven after the sides are done. Lightly grease a baking sheet with the last 1/2 teaspoon of olive oil (just spread on the foil to prevent the cod from sticking); arrange the filets on the baking dish, top each with 1 tablespoon of the soy ginger dressing and bake for 12-15 minutes until fish is cooked through and firm. Taste at table and if desired adjust seasonings by adding salt and pepper or add a squeeze of lemon or lime.